Flanesford Priory01600 890 506work01600 891 019fax Self-cateringFurnished to a high standard, apartments have wood burners, televisions, Blu-ray DVD players, combining the traditional character of Flanesford Priory's original exposed beams and stone walls with modern luxury. Linen and electricity are included. There are also on-site laundry facilities, plenty of parking, large gardens with seating areas to enjoy the outstanding views. 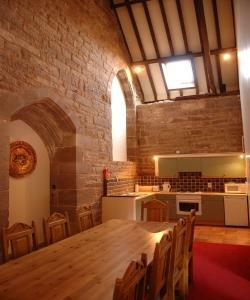 Apartments are ideal for couples, families or larger parties and special occasions. Pets by arrangement only and at an extra cost. Beds on mezzanine floors may not be suitable for young children. All apartments have steps/stairs which may present difficulties for those with severe mobility problems. Furnished to a high standard, apartments have wood burners, televisions, Blu-ray DVD players, combining the traditional character of Flanesford Priory's original exposed beams and stone walls with modern luxury. Linen and electricity are included. There are also on-site laundry facilities, plenty of parking, large gardens with seating areas to enjoy the outstanding views. Apartments are ideal for couples, families or larger parties and special occasions. Perfectly situated in the Wye Valley for sightseeing, walking (on the Wye Valley Walk), fishing, horse riding, canoeing and touring. Found within easy reach are Ross-on-Wye, the picturesque Royal Forest of Dean, Symonds Yat, Wales, the Black Mountains and the Malvern Hills.